Colour: Topaz. Size: 10mm. Quantity: 20 Beads. 10 10mm topaz Czech glass fire polished beads. Imported from the Czech Republic. Beautiful beads to use in jewellery making. Size: 6x10mm. Colour: Smoke Topaz. Czech Glass Beads. Pinky Beige and a Light Brown. Topaz lampwork cube beads with gold foil centres and a black swirl pattern inside. 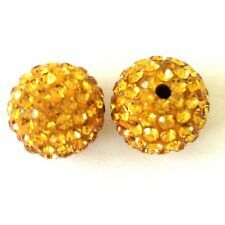 Rhinestone Clay pave Shamballa Style Round beads with approx 83pcs Agrade pp1 2 Rhinestone. Colour: Topaz. Size : 10mm. Quantity: 10 Beads.